I am growing tomatillos this year! I cannot wait. I picked one up last year with no expectations and it did nothing. I mean, it was green and it grew and got beautiful yellow flowers, but then – nothing. I mean, I can grow tomatoes just fine. Where o where were the tomatillos? Tomatillas are not self-pollinating, it turns out. 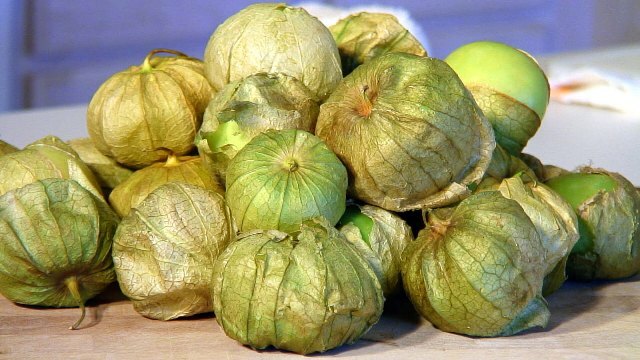 So – they need to be in a serious, commmitted relationship with other tomatillos. I got 4 this time. They are indeterminate, grow 3 to 4 feet high and put down roots through their stems, so the idea is to plant them very deeply and then stake them. I am so excited I am going to give them a place of honor this year where the pond used to be, right near the patio so I can keep a good eye them. I hear if they are happy they go a little nuts. I hope that happens. In about 75 days, I shall be in the kitchen making garden fresh salsa verde and it is going to be incredible! Want some?